Thumbs up: You can now thumb-up (or 'like') a posting. It's a useful and quick way of showing approval to what someone else has written. You can hover your mouse over the thumb and see who has liked it. Thumbs-up is also installed on each issue - replacing the old voting system. Hashtags to link posts together: You can link disparate messages from around the site together by using hashtags. This works in basically the same way to other sites like Facebook. Just prefix a word with a hash sign (#) and it will turn into a link to a page showing all the other messages containing that hashtag. This is specific to each group. So, for instance, members of Placeford Cycling Campaign could mark items that could go into their newsletter just by writing #newsletter in a post. There's also an index of all hashtags for each group. Planning applications: Thanks to PlanIt, with whom we have been working, planning applications from some 78% of councils around the country are now coming through to Cyclescape, via your My Cyclescape page. This gives you easy access to development proposals in your areas, usually within a few days of them being posted on your council's website. If you know about an existing development, you can now paste its number into the search box to get to it quickly. Revamp for setting locations you're interested in: We've completely reworked the way you specify what areas you're interested in. Now you can type in an area, e.g. your local council ward, and the system will come up with a set of suggested areas you might like to follow. 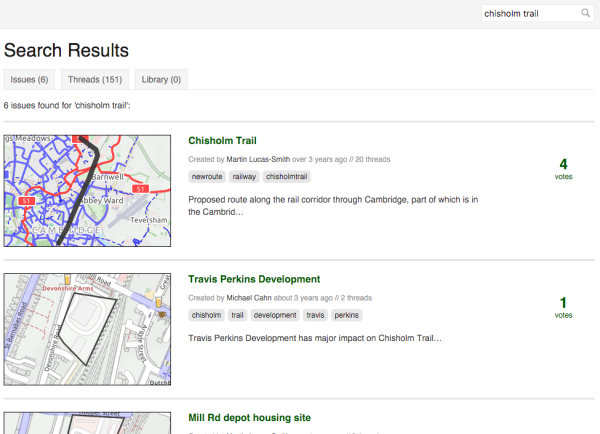 This means you don't have to know how to read a map (and then draw on it) to set it - now you can search by name. We've got groups, constituencies and wards all loaded. 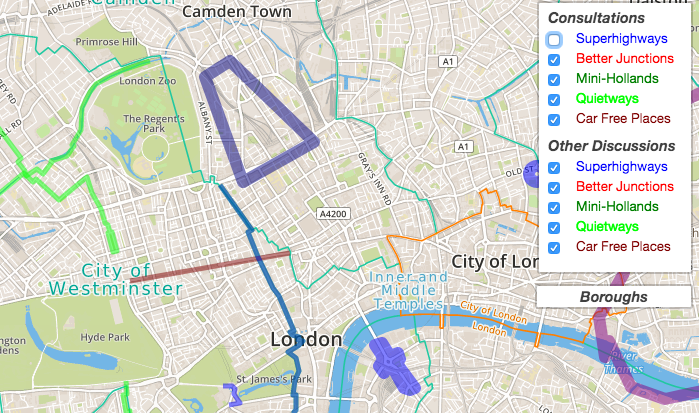 You can also plan a cycle journey to get an A-B route you want to monitor, e.g. so that you get told about issues along your way to work that other people have reported. The new interface also show you how many issues the areas you've selected would match - so you know whether you'll get more than you can handle. We'll have a blog post about this soon, and will be making further improvements to it, as there are some rough edges still. You can see the full list of changes (available via the 'What's new' link at the bottom of all pages of the site). Now that we've got these in place, we'll be starting soon (subject to funding) on a long-awaited major revamp of the layout of the site, moving things around to make everything much clearer, as we know that new users are still confused by how to subscribe to things. This work has been possible kindly thanks to grant support from the Polden-Puckham Charitable Foundation. Thanks also to Nikolai and other contributors who have made these improvements possible. This is a techie blog post, for the information of developers. If you're an ordinary user, you'll probably want to skip this post! Cyclescape now has a fledgling developer API is now available. Basically, this enables data in Cyclescape (public information - no personal data is involved) to be used in external systems, making it more useful. Issues - what problems exist, and when were they reported? Tags - what are the themes of problems that people are talking about? London Cycling Campaign are using this to create a map of current consultations in London, thanks to work by Camden Cyclists. You can create a similar map using the code for the map, which is open source. CycleStreets (who run Cyclescape) has been working on a new website, Bikedata. The Bikedata site aims to provide cycle campaigners around the UK with a ‘one-stop shop’ for data that helps them in their work. You can read more about the Bikedata site. 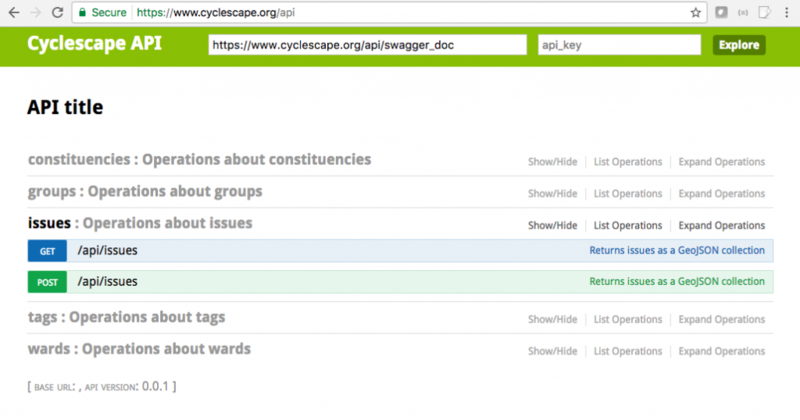 We've used the API to pass through reported issues on Cyclescape to Bikedata. We've also added a layer showing all groups. 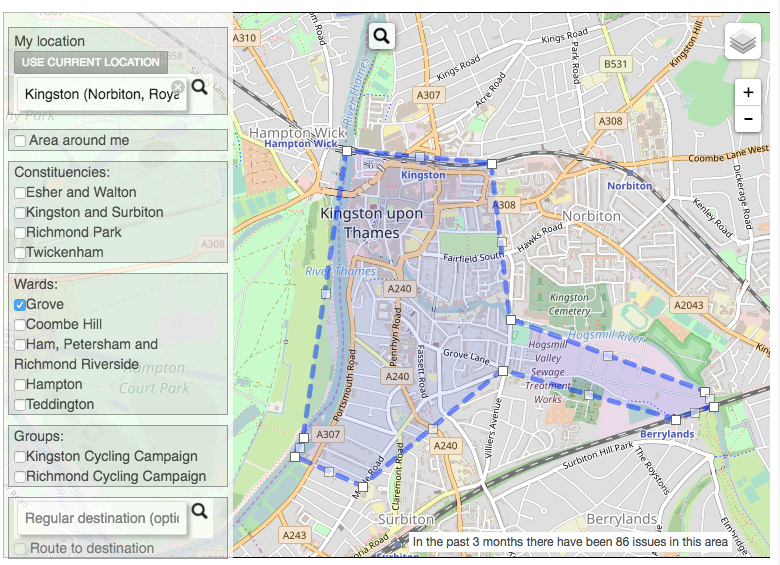 Geographical data is GeoJSON, making it easy to add to a Leaflet or other map. Link back to the site, rather than copying material which will then go out of date. We expect that more API calls will be added in future. Let us know if you have any particular requests for the API. Here are the improvements we've been working on lately, all live. We've been focussed on quick wins to make using the site easier - but we know there is still some way to go. Unread postings now coloured differently: All around the site, unread postings are marked in blue in discussion threads you haven't yet read. This should make it much easier to keep track of things! 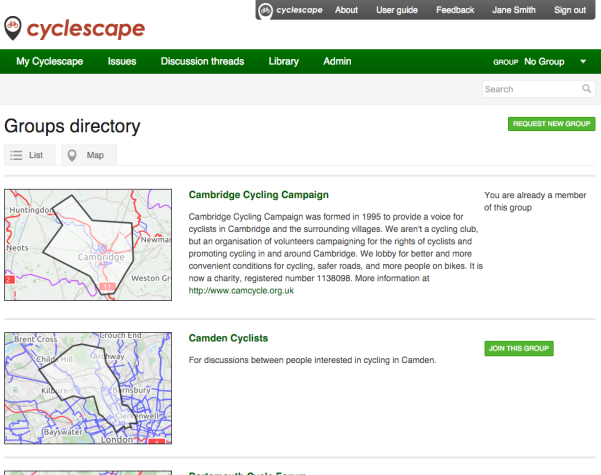 Front page - My Cyclescape: We've at long last cleaned up your My Cyclescape page, getting rid of pointless boxes and giving it a spring clean. Also, the limit of 12 messages before has gone - you can now click through to the next page of updates. So if you haven't been to the site for a while, you can be sure not to miss anything. Layout improvements: To save you having to scroll back to the top of a page, we've set the top bar to stay in place all the time now. Also, there's a link in the bottom corner to the top of the page. Another little fix has been to make the list of subscribers to a discussion clearer - people are now listed in a sensible alphabetical order at last. E-mail improvements: You can now unsubscribe from a discussion thread on a topic in one click - before this involved remembering to click the unsubscribe button. For digest users, the e-mails now include a link to the original of each individual message. Also, members of a committee getting committee-only e-mails will see this more clearly marked now. Direct messaging: The top bar now has an 'envelope' icon, giving you access to direct messages. It'll show you how many unread messages there are, to help you avoid missing any. Closing a thread: To help keep the site clean, you can close a thread using the button at the end of the discussion. This can now be done at any time - previously there was an arbitrary 2-day wait which we've now removed. People can re-open threads just by posting again, but by closing old threads, searches and other listings will work better. Issues can now have more than one location: You can now report an issue that has a set of locations. For instance, supposing the council is consulting on making a set of one-way streets to way for cycling. Previously, this was hard to represent - it meant either drawing a large box or a convoluted area. Now you can draw a line for each street when creating the area. The same multiple area system also applies to groups and library items. Improvements for groups: There's now a group finder on the front page. It's now also possible to request to create a new group online. Also, committee members are now automatically subscribed to administrative discussion threads. Potential members list: The membership secretary of a group can now paste in their membership list (as a list of e-mails), so when a user signs up they are automatically added to the group if their email matches one in the potential members list. This system is fully privacy compliant, as we don't store the e-mails of potential members - just an alphanumeric code representation of each e-mail. Direct messages: You can now direct message another person (i.e. a private thread between two people). To use this, click on someone's name (e.g. in a discussion thread listing), and that takes you to their profile page. You will then see a green 'Send private message' button. This creates a discussion thread like any other, except it's just between you and the other person. Such discussions will be listed on the 'My Cyclescape' overview page like any other, and there is also now a Mail icon in the top-right (which we will soon make 'light up' when you have a message). CycleStreets Photomap integration: You can now add to the thread discussion a photo direct from the CycleStreets Photomap, using the 'CycleStreets photo' button, alongside existing options like Text, Photo, etc. Click on 'CycleStreets photo', then find the image (the geographical starting point will use the issue's location), click the green button to choose the image, and that will pre-fill the caption, which you can adjust. Scroll down and submit. Also, each issue page now has options to see both collisions and CycleStreets Photos. Leader of a discussion: You can now set yourself as the 'Thread leader', to indicate that you will take responsibility for ensuring a discussion moves forward. This is helpful so that people have a clear contact point if a discussion is going nowhere rather than resulting in useful activity like letter-writing or press work. Click the new 'Thread leader' option in the reply area. You can give a brief additional note if you want, before pressing submit. This will add a message to the thread noting that you have become thread leader. The thread leader will be indicated on the right sidebar. This feature will see further user interface developments, but we've added the main mechanics now. Membership link: The Committee members in a group now gets an additional 'Membership' link in the main menu, giving an easier link to the membership list. 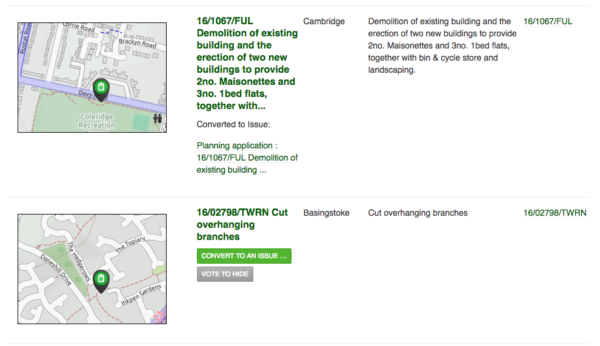 Planning application improvements: Last year, we added planning applications to your 'My Cyclescape' page. Over the summer we've fixed various bugs relating to planning application processing. We identified a scenario where a failure in processing a particular application (e.g. if it were somehow incorrect with a missing field for instance) in some cases could cause the import not to complete. If you become aware of a planning application number and it does not appear in a search, please report the number and Local Authority on this bug report page and we can check further. Planning application integration is now live for around 55% of the country, thanks to PlanIt. Over-long subject lines for planning applications are now avoided, and there are numerous other bugfixes. Tag cloud: There is a new tag cloud on the Tags page in the main menu. This gives an entry point into common themes. It's not the most earth-shattering improvement, but we hope you like it anyway, as we needed a way into the tags listings. Library items now are geographical: Adding a Library item now enables a geographical area to be added. We will gradually enforce this once a complete reworking of the area-setting workflow has been done. Library listings: The library is now paginated. This is one of a number of long-needed improvements to the Library, which had been left in prototyped state for many years, but we're now starting to prioritise this a bit more. Spam filtering: Various admin controls have been added. Twitter sharing buttons: A button to 'Tweet this' has been added on each issue page. We've gone HTTPS: For your further improved privacy, all traffic to the site is now HTTPS (i.e. encrypted). Previously, just password login pages were HTTPS. Any HTTP links will redirect to HTTPS automatically. Leaflet.js: We've completed a major change 'under the hood' which is to replace our map framework from OpenLayers 2 to Leaflet.js. Now that this is in place, this unlocks a major interface change that we're planning. Developer API: A fledgling developer API is now documented. London Cycling Campaign are using this to create a map of current consultations in London, thanks to work by Camden Cyclists. More will be added in future. Let us know if you have any particular requests for the API. Lots of other little bugfixes! We welcome any suggestions via the feedback link at the top of any Cyclescape page, or via our Github issues page, which is read directly by the development team. This work has been possible kindly thanks to grant support from the Polden-Puckham Charitable Foundation. Thanks also to Nikolai and other developers who have made these improvements possible. 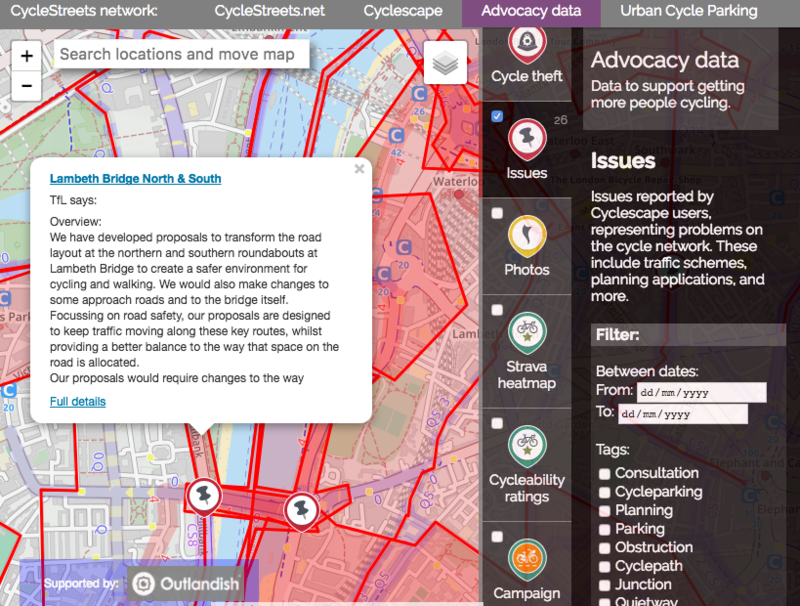 We recently added a feature where planning applications in your area are automatically pulled into Cyclescape, so that new developments which affect cyclists can be turned into issues easily. We knew this would need some tuning, and a common request has been to filter out tree works, advertisement applications, and similar applications that are almost never of relevance to cycling. So we've added a feature to filter out planning applications on an area-by-area basis. 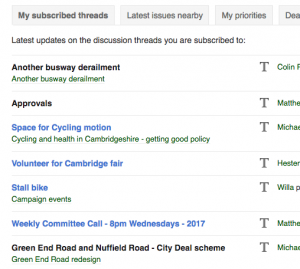 For instance, in Cambridge all the tree works applications like 13/046/TTCA end in /TTCA , so we've added that as a filter. Because each Local Authority area has its own web-based planning application system (though some use the same backend), the filters currently have to be defined as patterns to exclude. Please look through the applications and see if you can spot the patterns for your area, and let us know via the feedback link at the top of any Cyclescape page. We're busy working on various improvements and new features for Cyclescape, and we know there are usability things still needing work. So we'd really welcome your views on what your priorities for improvement would be. Please fill in our quick survey! We'll be also including comments received in our report to funding bodies that we've obtained a grant from. All comments submitted are anonymous - please be as honest as you can! 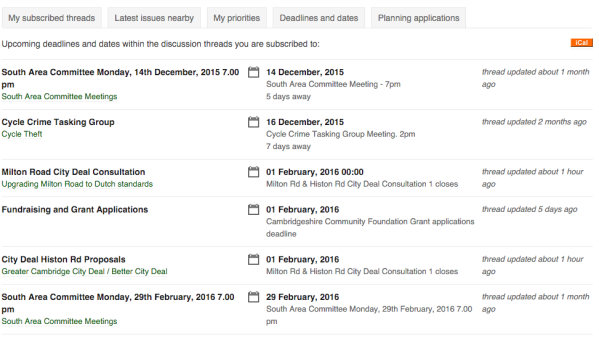 One of Cyclescape's features to help cycle campaign members is the ability to add a deadline/date as a type of message posting. We've made some improvements to make better use of these postings. Firstly, we've added an iCal feed, so that if you use a calendaring system like Apple Calendar, Google Calendar, Outlook, etc., you can have these events appear automatically in your calendar. In most systems you can click on the orange iCal link in the top-right to add the calendar, or for web-based systems like Google Calendar, right-click and choose 'Copy link', then add that web address in the relevant part of the calendar system's interface. 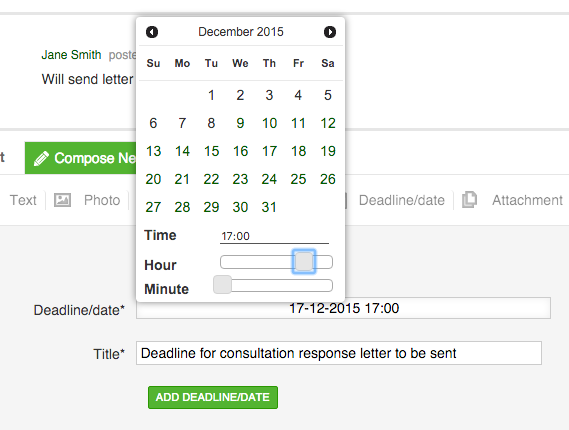 If you have e-mail enabled, each deadline/date e-mail will now include an iCal attachment for that deadline/date. Another improvement is that you can now specify a time, rather than purely just a day. This is particularly helpful if you're using the calendar integration, to avoid full days appearing. Improvements we plan to add next are some instructions for different calendaring systems, better support for iCal with Outlook (which is known to have bugs relating to multiple iCal entries), optional notifications by SMS, reminder notifications for non-e-mail users, and time range support. This work to facilitate work by local cycling advocates has been possible thanks to grant support from the Polden-Puckham Charitable Foundation. Thanks also to our developer, Nikolai! 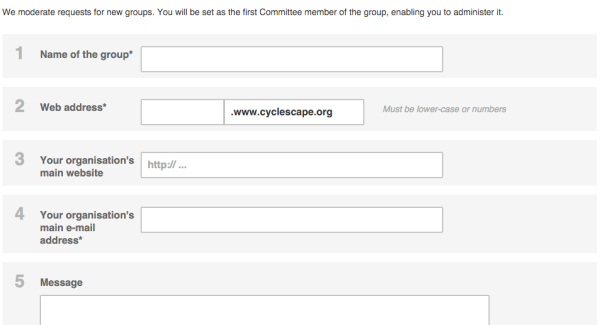 Did you know that you can also get Cyclescape discussions by e-mail? In fact, Cyclescape can be used like lots of mini e-mail lists, which you can choose to subscribe/unsubscribe to on a per-thread basis. We've made a number of improvements over the last month. Firstly, you can now enable digests, so you can read what's happening by getting a single e-mail a day. Just head to your e-mail preferences and enable digests. Of course, the option to get one e-mail per reply, like an e-mail list, remains available. Firstly, e-mails are now properly threaded. Not the most earth-shattering change, perhaps, but for power users this is an essential bit of inbox cleanliness. Next, we've added deadline reminders, so you'll get a reminder a day or two before a date in a thread you're subscribed to. So fewer excuses for missing deadlines now! Another small improvement is that we automatically strip e-mail encryption keys from messages, to avoid unnecessary attachments appearing in discussions. We plan to redesign the layout and wording of e-mails soon, so that things like privacy settings and options are clearer. We'll also be making the new digests laid out more similarly to the classic 'mailman' layout. New users now receive a welcome e-mail to confirm their signup, and to point to the settings and other things they might wish to set. Users also receive an e-mail upon successfully joining a group. Committee members of the group can configure the contents of this e-mail. We're pleased to announce that we've replaced the search result system with a completely new engine that gives much better results. After a week of tuning the results, we think this now seems to find what you're looking for pretty consistently. A bit of history: the search system that we launched with was really just a basic text search that didn't have any proper ranking system. Accordingly, this meant that the issue or discussion thread you wanted appeared hidden randomly amongst lots of other results. The new system is a proper search engine, with rankings that we can tune and improve over time. We've already added various tweaks. Let us know via the feedback link on the site if you get a search result hasn't found what you know is there. Secondly, we've added pagination, so you're no longer limited to one page of results. Another long-awaited improvement is that searches within a group's area will only return results from that area. So if you're in, say, Camden Cyclists' Cyclescape area, you won't get results polluted with issues from Cambridge, Sheffield, Leeds, or wherever. Next planned improvement is to integrate the planning application search into the main search area. We've made various improvements for group managers. 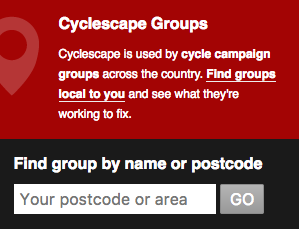 If you didn't already know, cycling groups are able to create their own Cyclescape space, giving a custom web address and various personalisations. Groups can now add a photo to help personalise their page, alongside information about the group. Each group's home page has a custom web address, e.g. http://camcycle.cyclescape.org/ (Cambridge Cycling Campaign), http://camdencyclists.cyclescape.org/ (Camden Cyclists), etc. For group committee members, we've also made various improvements to the user management area.